At a news conference today, leaders of NYC Health + Hospitals and the Mayor’s Office of Immigrant Affairs joined advocacy groups, elected officials, and labor partners in calling on all New Yorkers to speak out and reject the proposed changes to the “public charge” rule. 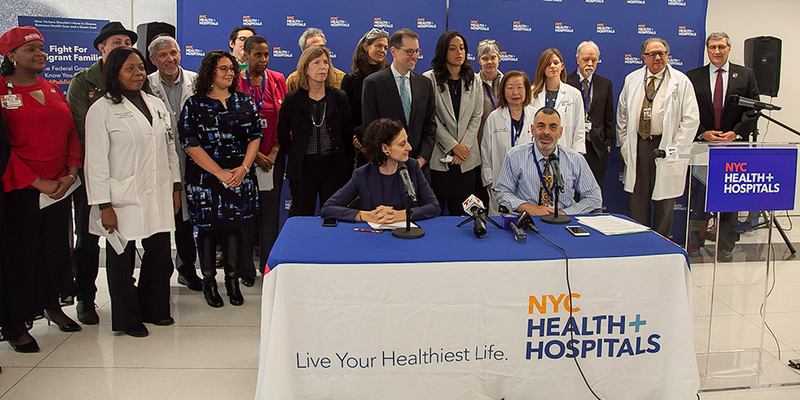 The news conference was held at NYC Health + Hospitals/Gouverneur. According to a new modeling analysis, the proposed Department of Homeland Security policy could impact 350,000 NYC Health + Hospitals patients and hit the public health system with a loss of up to $362 million in the first year. The term “public charge” is currently used to describe a person deemed to be primarily dependent on government assistance. Changes to the federal public charge rule, if they were adopted, could prove to be a far-reaching and highly damaging immigration policy shift, penalizing immigrants for utilizing certain public benefits for which they are eligible—essentially forcing them to choose between proper medical treatment and pursuing a green card or visa renewal. The proposed changes to public charge would penalize individuals that the federal government deemed likely to become a “public charge” in the future, based on a variety of characteristics—including age, health status, employment history, education, and use of certain public benefits. “As New York City’s single largest provider of health care to Medicaid recipients, we are alarmed as we hear about legal immigrants who are dropping their Medicaid coverage out of sheer fear that it may jeopardize their path to getting a green card or visa approved in the future,” said Mitchell Katz, MD, President and Chief Executive Officer of NYC Health + Hospitals. “New Yorkers should not have to choose between the health care services to which they are entitled and a green card.” Dr. Katz noted that the health system has already had patients decline to enroll in Medicaid, others who have disenrolled from its MetroPlus health plan, and still others who have opted out of the WIC program (the Special Supplemental Nutrition Program for Women, Infants, and Children). Yet the current impact pales in comparison to the much larger anticipated effects if the rule is to be implemented. Serving more than one million New Yorkers annually—40 percent of whom are born outside the United States—NYC Health + Hospitals is likely to bear a disproportionate burden if the changes to public charge were to take effect. The proposed rule would pose significant risks, partially due to fear, and could harm 350,000 of its patients, according to a review conducted by the public health system on the potential impact. Specifically, NYC Health + Hospitals’ analysis suggests that as many as 62,000 patients could abandon Medicaid and other insurance. Also concerning, more than one million patient visits could be skipped. And much-needed prescriptions to prevent or treat contagious diseases like the flu and tuberculosis could go unfilled. Just as disturbing are the predicted declining health outcomes that could result, including increased complications in pregnancy, more premature births, and maternal deaths. The analysis conducted by public health experts at NYC Health + Hospitals involved extensive modeling based on real-world outcomes of the Welfare Reform Act of 1996, U.S. Census data drawn from the American Community Survey, and de-identified patient insurance coverage information from within the public health system. A range of effects were modeled, based on resulting estimates of patients who could drop insurance coverage (including but not limited to Medicaid), patients who may forgo their current ongoing medical care, and patients who may ultimately need more expensive emergency care as a result. Beyond the negative health impact on patients and their families, NYC Health + Hospitals’ analysis shows that its health system could get hit with a financial loss of as much as $362 million in the first year. This total does not include all related financial impact; for example, thousands of NYC Health + Hospitals’ frontline staff, including medical providers and social workers, would need to be trained on the nuances of the proposed rule and how to best support patients—at a cost yet to be determined. The proposed rule is not a done deal. The best way to make your voice heard is to submit a comment by December 10 to www.nyc.gov/PublicCharge. You cannot be penalized later for using any benefits now—before changes to the rule could take effect. The rule is not retroactive. So patients should continue to seek care without fear. Even if the rule is to be implemented, the mission of the public health system will not change. It will continue to serve all, regardless of ability to pay or immigration status.